In one-way or another, we are all students. We attend classes each day while here on this earth. Some lessons are painful, while others bring us joy. Some of us apply ourselves to the task at hand, while others are hardheaded and slow to learn. No matter how old or how young you are, Bishop Sheen has helped millions of people to make sense out of what many of us call ‘the mysteries of life’. This website is designed to help introduce Bishop Sheen to a new generation of readers, listeners and viewers. Here you will find some audio recordings given by Bishop Sheen. As well, there will be links to a number of YouTube videos, along with a list of books, pamphlets and publications written by this very wise and holy man. Bishop Sheen is on a spiritual journey to Sainthood. We are all called to join him on this journey of becoming Saints. May I assure you that by listening, reading and watching Bishop Sheen your life will be enriched. Each year we visit hundreds of seminarians across the country. We give to each one of them a selection of books written by Archbishop Fulton J. Sheen. Titles such as The Priest is Not His Own, Those Mysterious Priests, Life of Christ , The Worlds First Love, Treasures in Clay, Calvary and the Mass, Victory Over Vice, These are the Sacraments and The Way to Happiness are helpful resources in their spiritual formation. Along with these books, we give the seminarians a good supply of audio reflections from talks given by Archbishop Sheen during his years of radio broadcasts, television shows, lectures and retreats. Just think of the great homilies and spiritual council these men will be able to give after spending a few years studying these books and audio reflections. It was said that “Archbishop Fulton J. Sheen spent the last 10 years of his life given retreats to Priests, Religious and Seminarians. He felt that the key to the renovation of the Catholic Church and the salvation of souls was to renew the priesthood”. With your help, we hope to continue this work that he began many years ago by sharing these resources with these seminarians. God Love You. 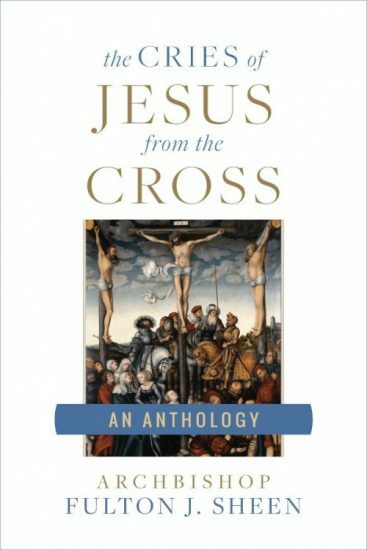 With a donation of $50.00 or more to Bishop Sheen Today, we’ll send you a copy of Cries of Jesus from the Cross, A Fulton Sheen Anthology (includes shipping). For the first time ever, Archbishop Fulton Sheen’s complete writings and reflections on Christ’s last words have been compiled into this one book. Sheen shows how the seven words are, in fact, a full catechism on the spiritual life. From them, you’ll learn the secrets to living the Beatitudes, ways to avoid the deadly vices of anger, envy, lust, and pride, and how to cultivate the heavenly virtues of fortitude, prudence, justice, and charity. For more videos such as the first few seasons of the 1950’s Life is Worth Living series, where Bishop Sheen won an Emmy Award for ‘Most Outstanding Television Personality,’ to The Fulton Sheen Program in the 1960’s, and various retreats and reflections, click here. Eternal Father, You alone grant us every blessing in Heaven and on earth, through the redemptive mission of Your Divine Son, Jesus Christ, and by the working of the Holy Spirit. If it be according to Your Will, glorify Your servant, ARCHBISHOP FULTON J. SHEEN, by granting the favor I now request through his prayerful intercession (mention your request). I make this prayer confidently through Jesus Christ,our Lord. Heavenly Father, source of all holiness, You raise up within the Church in every age men and women who serve with heroic love and dedication. You have blessed Your Church through the life and ministry of Your faithful servant, Archbishop Fulton J Sheen. He has written and spoken well of Your Divine Son, Jesus Christ, and was a true instrument of the Holy Spirit in touching the hearts of countless people.